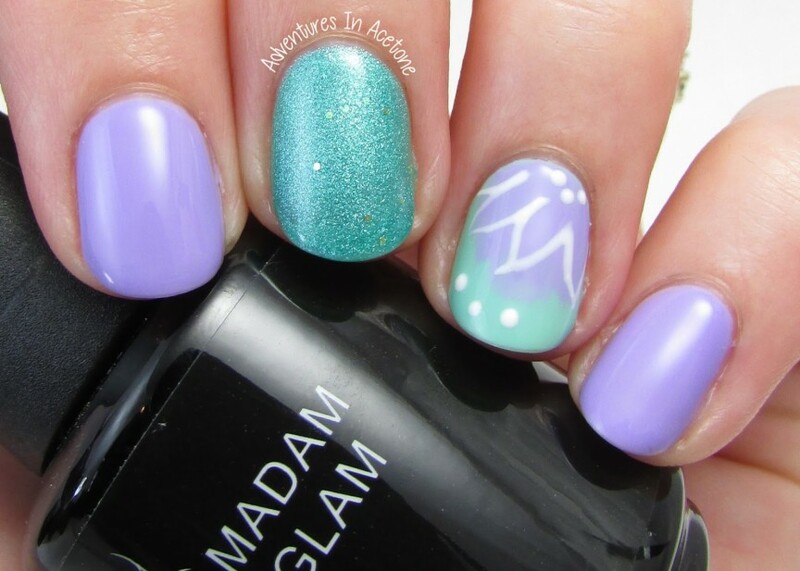 Madam Glam Gel Polish Nail Art! Good afternoon, readers! I am dabbling into the world of gel polish and nail art with gel polish. Madam Glam recently sent me a handful of new gel colors so I’ll be trying them out in nail art as well as showing swatches over the next few weeks. This first look was simple and inspired by the lovely Emily over at The Lacquerologist! She showcases some of her nail clients’ manis on instagram and they are often wearing gel polish nail art. I chose to do her Splash Floral design and a shimmery accent nail to complement the light purple creme I wore on most of my nails. Let’s take a look! I actually took these photos two days after I painted this mani because I didn’t have time. Don’t they look fabulous for a 2 day old mani? I can hardly ever get 2 days out of a regular polish mani. I’ve been wearing it since Friday (so 5 days right now) and it’s still going strong with gorgeous shine and there are no chips or noticeable tip wear. I’ve cured this mani layer by layer with a 12W LED full hand lamp. For the nail art accent nails: I applied and cured the base coat, applied and cured the base color, painted the purple splash, cured, painted the white lines, cured, added top coat, and cured a final time. It seems like those would take a while, but 30 seconds to cure each layer was no time at all. My thumbs, index fingers, and pinkies have Madam Glam Soak Off Base Coat, 2 coats of Madam Glam Light Lilac, and a coat of Madam Glam Soak Off Top Coat. My middle fingers have Madam Glam Soak Off Base Coat, 2 coats of Madam Glam California Love, and a coat of Madam Glam Soak Off Top Coat. My ring fingers have one coat of Madam Glam Soak Off Base Coat, 2 coats of Madam Glam Honeydew, a splash of Madam Glam Light Lilac, white accents of Madam Glam Perfect White painted with a thin nail art brush and a dotting tool, and one coat of Madam Glam Soak Off Top Coat. What do you think of this fun gel polish manicure? I can already tell I am going to love having the option to wear gel polish for a week+ at a time when it’s too crazy around here to change my polish every other day. You can see my previous wear test, tutorial, and review of Madam Glam Honeydew from a few months ago HERE if you are new to gel polish and want to learn more. Each polish(base coat, top coat, or color) retails for $19.95 each. However, I have a 30% off coupon code for my readers! Use code YGEL30OFF.